Acme Barber, originally uploaded by Thomas Gehrke. I love finding these little slices of Americana. This was taken in downtown Sandusky, Ohio on a trip to Cedar Point. 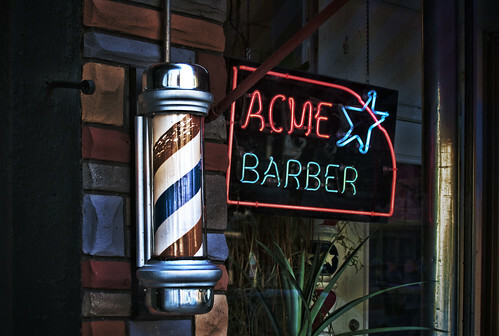 I enjoy the colors in the bricks and the neon sign, but there is something that is iconic in a good, old-fashioned barber pole. It also amuses me to think that this must be where Wile E. Coyote gets his hair cut.